Several months ago I was strolling at the local shopping center, and I stepped into the record store there. Formerly, the merchant that occupied this space was a branch of HMV, and since then has passed into the hands of an independent merchant. I was pleasantly surprised with the (modest) quality of "classical" titles. There were a few titles from Universal's VIRTUOSO discount reissue series that attracyed my attention, in particular a Rachmaninos coupling Rafael Orozco and Edo de Waart / Rotterdam Philharmonic Orchestra. In my vinyl collection, I have the same coupling with the same artists but with a different orchestra (The Royal Philharmonic, Philips FESTIVO series). According to the Discogs website, Orozco and Waart recorded the complete Rachmaninoff concerti in 1973 with the Royal Philharmionic and my record is an excerpt from this set. 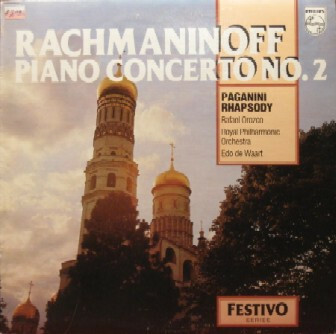 These Rachmaninov recordings were extensively recycled - among others, in a 1993 double-compact ("The Best Of Rachmaninoff") with as filler a recording by Waart with the Rotterdam Philharmonic Orchestra of the second symphony and the symphonic poem "The Isle of the Dead. Another double-compact of the same series features the 1973 full digital format. Today's YouTube playlist (featuring clips from Universal International Music B.V.) announces the Rotterdam Orchestra with copyright "℗ ℗ 1973". In addition, the cover is the same as that of the 1993 reissue that identifies the orchestra as the Royal Philharmonic. So what is the orchestra: Rotterdam or Royal Philharmonic? Two possibilities: either that the original edition of 1973 proposes Royal Philharmonic as a pseudonym for the orchestra of Rotterdam, or (my theory) it was blundered. Take note of the orchestral attribution for sharing this week. All times are GMT +1. The current date and time is Apr-25-2019 17:09.